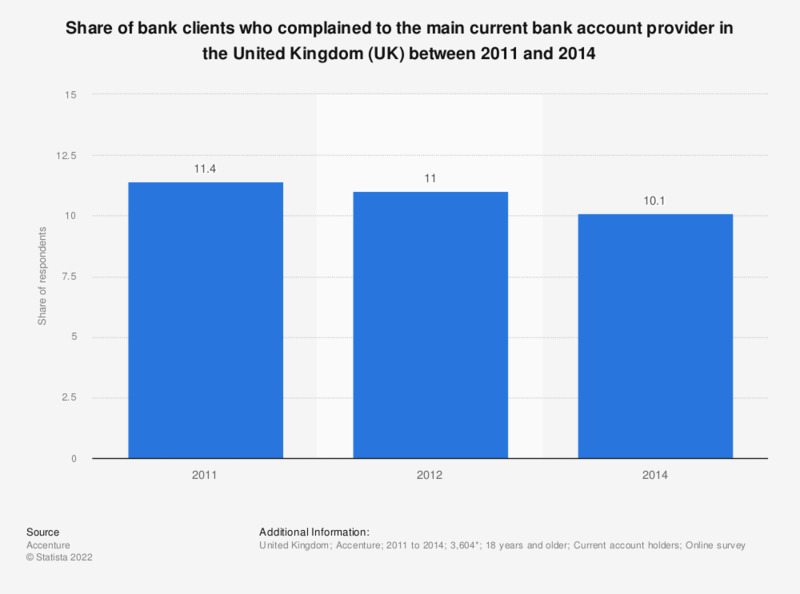 This statistic presents figures of the share of bank clients who complained to the main current bank account provider in the United Kingdom (UK) between 2011 and 2014. Effectively, the rate of complaints to the main account provider has diminished, from 11.4 percent in 2011 to 10.1 percent in 2014. * Number of respondents in 2014 = 3,604 UK current account customers conducted in March 2014. Number of respondents in 2012 = 4,009 current account customers in Great Britain, Northern Ireland the Republic of Ireland completed in October 2012. Number of respondents in 2011 = 3,873 current account customers in Great Britain, Northern Ireland the Republic of Ireland completed in October 2011. Everything On "Bank customer retention in the United Kingdom (UK)" in One Document: Edited and Divided into Handy Chapters. Including Detailed References. What were you doing the last few times you went into a bank branch? Which of the following have you done when you lost your temper with a customer service professional?